Make sure the nattokinase supplement you take passed our quality review and is right for you! Nattokinase supplements are promoted to reduce the risk of blood clots and reduce blood pressure, among other things. But does the clinical evidence support these uses? And which nattokinase supplements actually provide the enzymatic activity (measured in fibrinolytic units, or FU) claimed on labels? 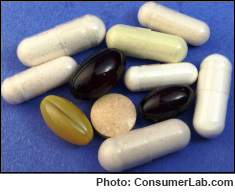 To answer these questions, ConsumerLab.com purchased and tested many popular brands of nattokinase and reviewed the studies which have been conducted with nattokinase. What we found may surprise you: Not every nattokinase product actually contains what it claims. Among those that do, you can save a great deal of money — over 75% -- by comparing products. We also found that the research behind some of the uses of nattokinase is still preliminary.